Every year, nearly $1 trillion in corrupt, criminal, and tax-evading money is drained from poor and emerging economies, depleting government coffers, undermining development efforts, and contributing to persistent poverty. In the past decade, international and multilateral institutions, such as the OECD, G8, G20, and United Nations, have recognized the corrosive impact of these illicit financial flows (IFFs) on developing countries and have begun taking steps to curtail this reality. Despite this growing recognition, much more work remains to fully address the challenge of IFFs. Effectively tackling the problem requires active cooperation between developed and developing countries to challenge and revise key assumptions and components of the international economic system facilitating IFFs. Such cooperation should be easy to achieve if premised on the notion that IFFs violate fundamental human rights. The right to economic well-being is a key component of global human rights norms and IFFs are directly responsible for perpetuating economic deprivation throughout the developing world, in distinct violation of these rights. The effect of IFFs can be profound and multiplicative: the loss of capital impedes the organic growth of the economy, the loss of tax revenue resulting from IFFs hampers governments’ ability to provide services and infrastructure for their citizens, and the perception of corruption and poor governance creates political instability and may discourage potential foreign assistance. The linkage of IFFs to persistent extreme poverty makes IFFs one of the greatest human rights challenges of our time. Advocates for curbing illicit financial flows often base their arguments on one of two rationales—the economic or the ethical. 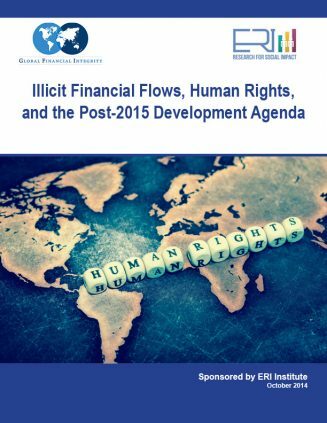 Illicit financial flows deprive developing countries of crucial resources needed for development (the economic perspective), and developed countries’ maintenance of the system that allows this deprivation to occur is morally unjustifiable (the ethical perspective). A rights-based approach to IFFs combines these perspectives, demonstrating the practical importance to developing countries of curbing IFFs while also providing a moral impetus for developed countries to do so. The ongoing process to establish the successors to the Millennium Development Goals presents a unique opportunity to galvanize international cooperation to tackle this issue and set a benchmark for its success. In this paper, we call upon all institutions involved in this process to make curbing illicit financial flows a key component of this landmark agenda.